Power Electronics Market size was approximately USD 34 billion in 2016, with growth pegged at 4% CAGR from 2017 to 2024. Rising awareness of the impact of fossil fuel depletion, increasing CO2 and particulate matter, and air pollution is one of the key factors impacting the growth of the power electronics market. Government push from various economies has amplified the adoption of renewable power sources across the industrial and residential sector and is driving the power electronics market. For instance, the Indian government through its Solar Policy added 4,765 MW in 2017 through large-scale solar and rooftop installations in its bid to complete 1 GW by the end of June 2017. Fifty solar parks with a capacity of 500 MW or higher are expected to be constructed by 2020. These require the presence of AC/DC converters and switching systems to operate efficiently. Improvements in the economies of developing regions is causing an increase in disposable income. The middle-class population is now capable of spending larger amounts on luxury goods and high-end consumer electronics. For instance, in 2016, China’s population of approximately 1.35 billion was reported to own over 500 million smartphones with approximately 49% owning a smartphone. The growth of such battery-powered devices is anticipated to positively impact the demand for the power electronics market as these devices require multiple units of switching devices that convert AC to DC voltage. The complexity of the manufacturing process and the initial costs of setting up production plants is hindering the entry of new players in the power electronics market. Additionally, a major challenge for vendors operating in the industry is the realising of the highest possible level of security while using the least amount of space. Power modules are anticipated to exhibit the highest growth, owing to their applications in motors and convertors for solar systems. For instance, in systems that require DC voltage to be derived from AC in devices such as smartphones, laptops, and tablets. Intelligent power modules are also instrumental in reducing the short-circuiting and over-current that might result in damage. The IC product segment is projected to dominate the power electronics market during the forecast timespan. These systems are essential components in LCD panels as high-speed oscillators and laser diode drivers which have high adoption in various consumer systems. Additionally, their applications in high-power, high-frequency systems such as RF, RADAR, satellites, and electronic warfare is making them an indispensable component to aerospace and defense end-users. Automotive applications are anticipated to lead the industry during the forecast timeframe. The use of these components in powertrains, infotainment devices, and safety and security systems are anticipated to drive this demand. Furthermore, the high penetration of electric vehicles owing to government initiatives is anticipated to contribute to the high adoption of power electronics market. The rising demand for battery, powered devices is a major driver of the power electronics market. Systems such as convertors or invertors and LED systems are ideal in the conversion of one form of power to another and to regulate or block the excessive bursts of voltage through a system. A major trend influencing the power electronics market adoption is growing applications in smart grids. A smart grid utilizes digital communications and control systems to monitor and control power flows. Their ability to accommodate renewable energy has aided in their strong penetration in the global marketplace as it provides information to customers and grid operators on the integration of renewable energy into the grid. The European Union (EU) has initiated plans that are aimed at replacing approximately 80% of electricity meters with smart meters by 2020. Large-scale solar power plant construction projects are a major factor driving the Asia Pacific power electronics market. For instance, in 2016, the Indian government-run NLC India announced the construction of solar power projects with 4,000 MW capacity under the National Solar Mission. This is largely due to government interest in the provision of low cost, renewable power to the rural and underserved population. The Europe power electronics market is expected to witness growth owing to government funding for electric vehicle manufacturers and grants and subsidies to vehicle owners. For instance, in France, if a diesel vehicle purchased prior to 2016 is swapped with a fully-electric vehicle, the owner is eligible for a bonus of approximately USD 11,653. Various other countries such as Italy, UK, and Germany have followed suit and initiated their own EV adoption plans. 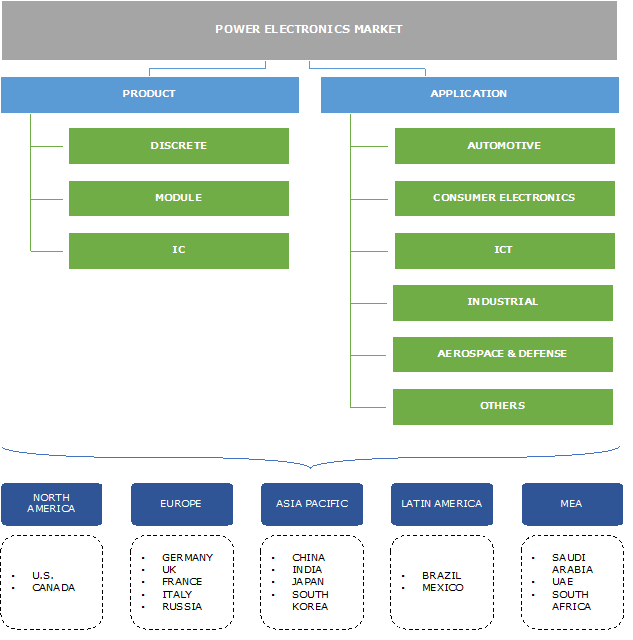 Companies operating in the power electronics market include ENERCON, Fuji Electric Co. Ltd., Infineon Technologies, Mersen, Microsemi Corporation, NXP Semiconductor N.V., ON Semiconductor, Semikron Electronics GmbH & Co., Inc., Texas Instruments Incorporated, and STMicroelectronics N.V. 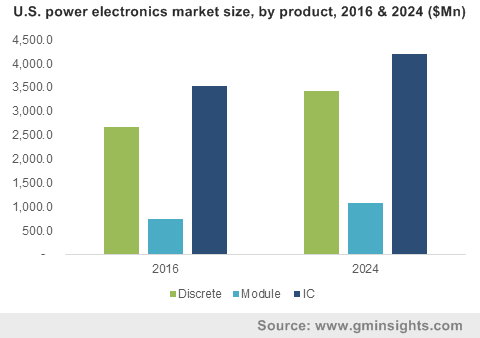 Vendors are required to undertake strategic initiatives such as product innovations, and mergers and acquisitions to sustain growth in the power electronics marketplace. For instance, in February 2017, Infineon Technologies proposed the acquisition of Wolfspeed Power & RF arm from Cree Inc. for the expansion of their SiC-based power electronics. Additionally, the company has also announced the partnering with Smart Wires for the improvements of existing grids for renewables. The power electronics market is highly competitive in nature, leading to a fragmented landscape. The players generally provide a wide range of components and do not limit themselves to providing only a certain range of semiconductors. For instance, a vendor providing MOSFETs also provides IGBTs and SiC power modules. A major trend amongst manufacturers is the outsourcing or subcontracting of the manufacturing process to third-party entities. By undertaking this measure, the company can focus vital resources, such as skilled labour, monetary bonds, and electricity, to reduce massive capital and variable costs. Power electronics market has applications across a wide range of products. All thought the industry is at it mature stage, the growth of industries such as construction, heavy machinery, power, household equipment, and oil and mining are anticipated to drive the demand.